Schematic of light passing through a fluorescence microscope. MDF-YFP filter set transmission graph. Note the dichroic mirror (green) reflects light in the excitation wavelength range (blue), and transmits light in the emission wavelength range (green). A fluorophore is a molecule or portion of a molecule that is capable of producing fluorescence. When light of the appropriate frequency necessary to excite a molecule from its ground state to an excited state is present, excitation will occur. However, once in an excited state, the molecule will be unstable. After some short period of time (typically 10-15 to 10-9 s), a photon will be released, thereby enabling the molecule to return to a lower energy state. The emitted radiation will be at a longer wavelength (lower energy) than the absorbed radiation due to the loss of energy through various mechanisms such as vibrations, sound, and thermal energy. A single fluorophore can be continually excited unless it is destroyed by photobleaching (i.e. the nonreversible destruction of a fluorophore due to photon-induced chemical damage or covalent modification). The average number of excitation and emission cycles that a particular fluorophore can undergo prior to photobleaching depends on its molecular structure and the local environment; some fluorophores bleach quickly after emitting only a few photons while others are far more robust and can undergo thousands or even millions of cycles before bleaching occurs. The experimental setup to the right shows the typical filters used for epi-fluorescence microscopy, a form of microscopy in which both the excitation and emission light travel through the microscope objective. By carefully choosing the appropriate filters and mirrors for a given application, the signal-to-noise ratio can be maximized. As shown in the schematic to the right, three types of filters are used to maximize the fluorescence signal while minimizing the unwanted radiation. Each optical element is discussed below. The excitation filter only allows a narrow band of wavelengths to pass through it, around the peak fluorophore excitation wavelength. For example, as shown in the graph to the right, the bandpass region corresponding to greater than 90% transmission for the Yellow Fluorescent Protein (YFP) Excitation Filter (MF497-16) is 489 - 505 nm; incident radiation outside of this range is either partially (for regions near the transmission region) or totally (for regions further from the bandpass region) blocked by the filter. Dichroic mirrors are designed to reflect light whose wavelength is below a specific value (i.e. the cutoff wavelength) while permitting all other wavelengths to pass through it unaltered. In a microscope, the dichroic mirror directs the proper wavelength range to the sample as well as to the image plane. The cutoff wavelength value associated with each mirror indicates the wavelength that corresponds to 50% transmission. 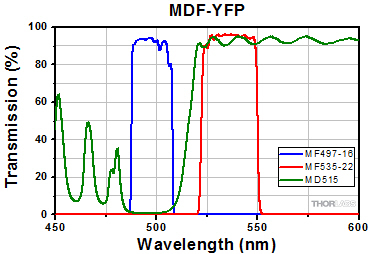 For example, as shown in the graph to the right, the cutoff wavelength for the Yellow Fluorescent Protein (YFP) Dichroic Mirror (MD515) is ~515 nm. The Specs tab provides information on wavelength ranges corresponding to ≥ 90% average reflectance and transmission for each type of dichroic mirror. By placing one of these mirrors into the experimental setup at 45° with respect to the incident radiation, the excitation radiation (shown in blue in the above right schematic) is reflected off of the surface of the dichroic mirror and directed towards the sample and microscope objective, while the fluorescence emanating from the sample (shown in red in the above right schematic) passes through the mirror to the detection system. Although dichroic mirrors play a crucial role in fluorescence microscopy, they are not perfect when it comes to blocking unwanted light; typically, ~90% of the light at wavelengths below the cutoff wavelength value are reflected and ~90% of the light at wavelengths above this value are transmitted by the dichroic mirror. Hence, some of the excitation light can be transmitted through the dichroic mirror along with the longer wavelength fluorescence emitted by the sample. To prevent this unwanted light from reaching the detection system, an emission filter is used in addition to the dichroic mirror. An emission filter serves the purpose of allowing the desirable fluorescence from the sample to reach the detector while blocking unwanted traces of excitation light. Like the excitation filter, this filter only allows a narrow band of wavelengths to pass through it, around the peak fluorophore emission wavelength. For example, as shown in the graph to the right, the bandpass region corresponding to greater than 90% transmission for the Yellow Fluorescent Protein (YFP) Emission Filter (MF535-22) is 524 - 546 nm; incident radiation outside of this range is either partially (for regions near the transmission region) or totally (for regions further from the bandpass region) blocked by the filter.